If you’re looking for tips and tools to help you figure out how to calm an autistic child at home, at school, in therapy, and while you’re on the go, you’ve come to the right place! Keep reading for our best tips to avoid meltdowns from occurring, managing the length and intensity of them when they do, as well as our favorite calming tools and activities to bring kids (and adults) back to a state of zen when big emotions threaten to take over. What is an Autistic Meltdown? Most, if not all, parents of children aged 2 and older have experienced a temper tantrum at some point in their lifetime, but few people truly understand the difference between a tantrum and an autistic meltdown. On the surface, they look pretty similar, but while temper tantrums are often goal-driven behaviors fuelled by an audience, autistic meltdowns typically occur in response to feelings of overwhelm and happen with or without spectators. Temper tantrums are often a manipulation ploy used by small children to try and get what they want and can typically be rectified through appropriate discipline. Autistic meltdowns, on the other hand, can happen at any age, are more intense and emotional, and typically last much longer. A meltdown typically begins with warning signals called ‘rumblings’, which are characterized as a build-up of emotions that cause screaming, stimming, pacing, and other behaviors that indicate the person is about to lose control, and if not redirected in time, can lead to an explosive rage. Managing autistic meltdowns can be extremely difficult. 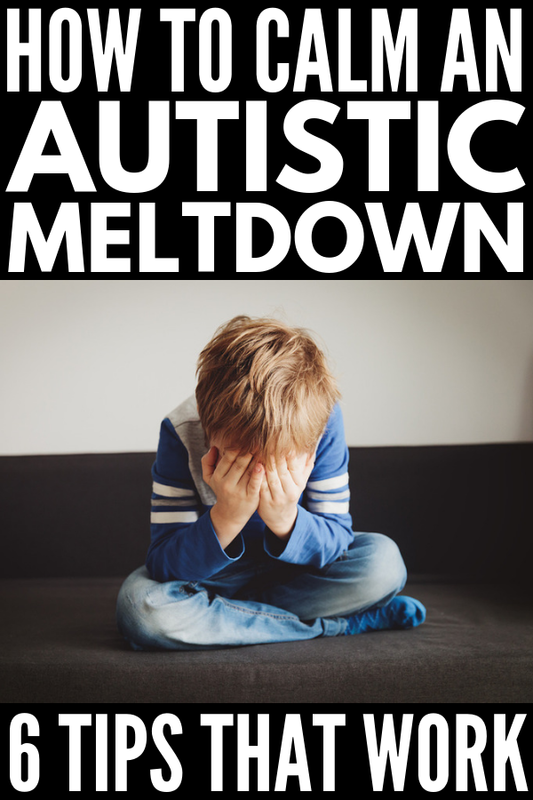 Unlike temper tantrums, autistic meltdowns cannot be lessened through rewards and bribes as the purpose of the meltdown isn’t to obtain something. There is no end goal other than gaining control over an overwhelming situation, and it takes time for parents and caregivers to figure out how to calm an autistic child, and how to prevent such behaviors from occurring in the first place. While temper tantrums can seemingly come out of nowhere, autistic meltdowns typically follow a predictable flow – rumbling, rage, and recovery – and there are certain things caregivers can do to help prevent them from occurring and lessen the intensity of meltdowns when they do happen. Here are 7 ideas to consider. Antecedent: The events that occurred before the meltdown happened. The idea is to track the same behavior – in this case, the meltdown – multiple times to determine if there are any consistencies, and then formulate a plan to change the antecedent and/or consequence to ensure the meltdowns stop happening. Formulate an action plan. While it may be tempting to avoid the things that trigger meltdowns in our children, avoidance behavior is a short-term fix with long-term repercussions, so tread carefully! Our ultimate goal as parents is to help our children become independent, so once you know which things trigger meltdowns in your child, it’s time to put pen to paper and find coping strategies your child can use when faced with things he or she finds overwhelming. Not sure where to start or what will work? Keep reading as we share more ideas on how to calm an autistic child! Recognize warning signs. The rumbling phase of an autistic meltdown often manifests itself in such a way that parents and caregivers can eventually spot the warning signs ahead of time. The child may tense up or withdraw, or they may exhibit more external signs like stimming, pacing, or talking under their breath. Whatever the predecessor is, early intervention is key in managing autistic meltdowns, so pay attention and act quickly! Redirect and distract. Once you’re able to recognize the warning signs of an impending meltdown, redirect and distract your child to the best of your ability to help keep his or her emotions from escalating. Stay calm. I know this sounds obvious, but when it comes to figuring out how to calm an autistic child, never underestimate the power of your own words, actions, and nonverbal cues. Lead by example by taking deep breaths, avoiding sudden movements, and talking in a soft voice to help instil a sense of calm in everyone. Change the environment. Wherever possible, remove the individual from the situation and take them to a quiet area to calm down. Consider creating a sensory room or corner in your home with calming tools handy, and always keep some of these calming ideas in your car or purse so you’re prepared and ready to intervene when needed. Allow stimming (if safe). While parents often try to discourage stimming in public, we fail to understand these behaviors help our child with self-regulation and should not be intercepted during a meltdown unless the individual is hurting him- or herself. Since no two individuals with autism are the same, managing autistic meltdowns can be quite individualized and it will take some trial on error on your part to figure out how to calm an autistic child successfully. The good news is that many parents, therapists, and teachers have walked the walk before you, and there are certain tools and strategies you can use to help keep big emotions under control when a meltdown threatens to erupt. Be consistent and stick to a schedule. Children with autism tend to thrive best when their life follows a regular routine with consistency across the board. While this isn’t always possible, maintaining a predictable schedule wherever possible will be helpful to your child. Talk to her therapists and teachers to ensure you are working in tandem, and when events threaten to disrupt your routine (i.e. travel, school holidays, etc. ), give your child as much advance warning as possible. Use visuals. Created using pictures, icons, words, etc., visual schedules are a visual representation of a sequence of events. Most classrooms use a basic schedule outlining the different activities students will be participating in throughout the day (this Daily Schedule Pocket Chart is a great option), but some children benefit from a more detailed outline of exactly what will happen from one moment to the next. This will ensure they know what is expected of them so they can plan ahead, allowing them to remain more in control of their emotions. CLICK HERE for a more in-depth discussion about visual schedules and why they work so well with children and adults on the autism spectrum, as well as some of our favorite free printables and paid templates you can start implementing today! Give warnings before transitions. Giving warnings before transitions is another great strategy for managing autistic meltdowns. This is especially important when a child is moving from a preferred activity to something he or she finds less interesting. A Time Timer is a great tool to use as it visually shows kids the passage of time, and providing a 10-, 5-, and 3-minute warning can also help make transitions easier. Use reward systems. Positive reinforcement – the act of reinforcing desirable behavior immediately after it occurs to increase the likelihood that it will happen again – is a fabulous strategy to help encourage good behavior in children with autism. Ignoring undesirable behavior (meldowns) and rewarding positive interactions through sticker charts is a great tool for managing autistic meltdowns. We talk more about how to calm an autistic child through reward systems HERE. Get a handle on sensory sensitivities. While some children with autism spectrum disorder have lowered sensitivity to environmental stimuli, others can be extremely sensitive to things like noise, light, temperature, tastes, and textures, which can make everyday living overwhelming and result in more meltdowns. The Sensory Smarts website is a fabulous resource for parents and teachers of children with sensory processing disorder. It was created by Lindsey Biel and Nancy Peske, co-authors of the book, ‘Raising a Sensory Smart Child’, and it offers all kinds of helpful strategies, including practical tips to help with daily challenges like tooth-brushing, bathing, and potty training. We’ve also created a comprehensive list of sensory diet activities you can implement at home to help work on and lessen the anxiety surrounding your child’s individual sensory needs, which you can read HERE. Create a calming ritual. When kids with autism are feeling overwhelmed, it can be difficult for them to self-regulate, and the emotional reactions they exhibit are nothing more than an attempt to gain control. Taking the time to teach our children calming techniques can go a long way in helping them feel less helpless when their emotions run awry. See below for some of our suggestions on how to calm an autistic child quickly as well as our favorite calming activities that can benefit kids of all ages and abilities. Keep stress relief toys on hand. There are many products on the market that are made precisely to help de-stress and calm children. A fidget cube is a good one to help kids and adults focus on something other than their feelings for a few moments. A sensory fidget slap toy bracelet is also a good one, as it’s a tactile toy that will distract younger kids when they feel overwhelmed. Even giving your child some coloring books and crayons can help them to calm down and get through their upset. My biggest suggestion when it comes to selecting and testing out different stress relief toys and tools is to find a few that compliment your child’s stimming tendencies. If he or she likes to spin things, a fidget spinner will be a great option. A sensory chew necklace will work well for kids who like to bite their nails, clothing, hair, etc. A fidget clicker works well with kids who need to keep their hands busy. Take time for yourself. One of the hardest things about being a parent of a child with autism or other special needs is finding ways to get a break, and when your child is prone to autistic meltdowns, it can sometimes feel downright impossible to grab a little R&R. But guess what? It’s actually NOT impossible. There are various respite care options available that offer help to parents of children with developmental challenges, and whether you opt for an offsite program or decide to hire a caregiver to come to your home, you can rest assured your child will be left in the capable hands of someone who is certified and trained to deal with his or her individual needs while you recharge so you can be more present and available when you return home. Your child isn’t giving you a hard time – he or she is having a hard time. I don’t know who first coined these words, but they great ones to keep in mind when your little one is having an autistic meltdown. Unlike temper tantrums seen in very small children, autistic meltdowns aren’t a ploy for attention or an attempt to ruin your day. Your child is crying, screaming, stimming, pacing, hitting, punching, and/or engaging in self-injurious behavior because he or she feels overwhelmed and cannot gain control over his or her emotions. Meltdowns are more difficult for your child than they are for you. It can often feel as though autistic meltdowns are harder on the parent or caregiver who is trying to intervene and diffuse the situation, but I promise you that is not the case. Autistic meltdowns are the result of intense feelings of overwhelm, and many autistic people feel embarrassed and guilty for their actions once they’ve calmed down. Of course, managing autistic meltdowns goes above and beyond understanding and compassion, and while no 2 individuals with autism are the same, and each respond to different calming strategies and techniques, this collection of ideas offers some great pointers on how to calm an autistic child quickly. Noise cancelling headphones. Autistic meltdowns often occur in response to feelings of overwhelm, and since many individuals with autism are sensitive to noise, a pair of noise cancelling headphones could be a game-changer for you and your family. Give them a try, and if you find they make a difference, keep a pair in your child’s school backpack, your purse, and the glove compartment of your car so you’re always prepared. If autism and noise sensitivity is a pain point for your child, I would also recommend giving foam ear plugs a try as they are much more portable and discreet. Deep pressure. The sensory input offered by weighted blankets triggers the release of serotonin, which in turn helps regulate feelings of anxiety. Of course, it’s not always practical to carry a 10+ lb blanket around with you (LOL), but weighted lap pads offer a great way to take advantage of deep pressure therapy while on the go. Before ordering your weighted blanket or lap pad, remember that they should be no more than 10% of your child’s body weight plus 1 or 2 pounds, and that blankets of any kind shouldn’t be used until a child is over 12 months of age. Can’t afford either tool and/or need a quick fix when you forget yours at home? Try firmly squeezing your child’s arms with your hands, starting from the shoulders and then moving down to the wrists. Blowing bubbles. Mindful breathing is a very effective calming strategy, but it can be difficult to teach to small children, and even those experienced with the technique can struggle when big emotions take hold. A simple way to encourage deep breathing to help your child find his or her way back to a place of calm is to blow bubbles together. This will force your child to take deep, calming breaths naturally, and the bubbles will serve as a fabulous secondary distraction. Lavender. Various essential oils are known to help children stay calm during transitions and sleep more soundly, and more and more people are using lavender oils, lavender rubs, and lavender sprays for managing autistic meltdowns. CLICK HERE for a much more detailed discussion on essential oils and autism, including which blends work best and how to use them safely. Tablet. If you’re on the go and cannot avoid one of your child’s triggers and/or you sense a meltdown coming on, equipping your child with a pair of noise cancelling headphones so they can watch their favorite shows, play their favorite games, and/or listen to calming music on a tablet is a simple distraction that can work wonders. Do nothing. While there are lots of other different tools you can try (and buy) to help calm an autistic meltdown, interventions can often do more harm than good, and sometimes the best thing you can do is move your child to a safe place and let the meltdown run its course. Managing autistic meltdowns isn’t always easy, especially since each child’s triggers are so different and the calming strategies that work for one child may not work for another, but incorporating different calming activities for autism into your routine is a great way to teach your child effective coping strategies. Mindful breathing. When a meltdown is starting to brew, your child’s breathing pattern will change. Often, he or she will begin taking short, fast, shallow breaths, which can make them feel even more overwhelmed than they are already feeling. Mindful breathing is a great tool you can use to teach your child to use when their emotions threaten to take over their bodies. There are many different techniques you can try, and I suggest starting with the Bubbling Blowing Technique. When your child is calm, give him or her a small container of bubbles so he or she can practice blowing bubbles with a wand. You child will quickly learn that if he or she blows too hard or too fast, the bubble will burst before it has time to take shape. But by blowing slowly and with purpose, he or she can blow a perfect bubble. Have your child practice the technique with real bubbles before removing the bubbles and letting him or her use only his or her imagination. Once this skill is learned, you can ask your child to ‘blow pretend bubbles’ when you sense your child feeling overwhelmed. Make a calm down jar. Also known as a ‘glitter jar’, this is simply a jar filled with glitter, glue, and water, as well as any other props that appeal to your child. They are easy to make and can be extremely soothing as they help decrease anxiety and fear while also helping with anger management. The act of shaking and watching the contents of a calm down jar settle forces the body to focus, which in turn allows your child to organize his or her thoughts and ‘center’ his or her nervous system. The idea is that, as the items within the calm down jar fall, so will your child’s heart rate and rapid breathing, allowing him or her to gain control over his or her emotions. To make your own calm down jar, mix glitter glue with hot water, add a few drops of food coloring and whisk vigorously until the glue ‘melts’ and mixes properly with the water. I don’t follow a specific glue/water ratio when I make mine – I just sort of throw it all together and hope for the best, LOL, but you can adjust to your preference. Next, add additional glitter, whisk vigorously one more time, transfer the mixture into a clear jar (I use an old Gatorade container with the label removed), and top the bottle up with water so it’s completely full. Allow the water to cool to room temperature before securing the lid with glue (I use a glue gun) to ensure it is properly sealed and won’t leak. Mindfulness Labyrinths. Mazes are one of my favorite mindfulness activities for kids as they are highly effective in helping children calm down and focus when emotions are high. I found this collection of ‘mindful labyrinths’ on Teachers Pay Teachers, which can be used as finger labyrinths or completed with a pencil. You can use them in a therapy or classroom setting, and I love that you can print a few off and keep them in your purse to help redirect your child’s emotions and make managing autistic meltdowns easier when you’re on the go. Coloring. I’ve recently noticed adult coloring books for relaxation popping up at book stores everywhere, which got me thinking about how coloring can double as a helpful calming exercise for children. Instead of just mindlessly coloring and chatting together after school, have your child say the steps she uses to color outloud as she completes them – ‘I am coloring’, ‘I’m going to coloring the flower pink’, ‘I’m picking up the pink pencil’, ‘coloring helps me feel calm’. The idea is to train your child to say these things quietly to him- or herself over time to keep him or her focused on the task he or she is completing, and to teach him or her how to use coloring as a mindfulness tool when the signs and feelings of an impending meltdown start to surface. Make your own zen garden. A friend of mine had a zen garden on her dining table when I was growing up, and I loved it. I found the act of ‘raking’ the sand so relaxing, particularly when we were studying for a test together. You can buy a zen garden for kids to help redirect your child when he or she is becoming upset and agitated, or you can easily make your own (a great activity you can do together!) using a small cookie sheet, sand, stones, and a fork. Self-regulation flash cards. If your little one struggles with impulsivity, emotional regulation, and anxiety, these self-regulation flash cards are a great way to prevent a meltdown from occurring as they provide breath and movement exercises kids can practice to help them focus, calm down, and manage their emotions. Sensory play. When a child is fully engaged with all of their senses in a particular activity, more neural pathways are actually created in the brain! Sensory activities can benefit all children and are of particular help to those on the autism spectrum. Sensory play offers a natural (and fun) way for kids to discover, examine, and understand their world, which in turn helps develop their language and social skills, fine and gross motor skills, as well as their self-control and self-regulation skills. Sensory activities can also be very calming, which can be particularly helpful to kids on the autism spectrum. If you haven’t already done so, it may be a good idea to discuss sensory activities for autism with your child’s occupational therapist or another trained professional to discover which types of activities are best for your child. We’ve got over 100 sensory play ideas you can start using at home RIGHT HERE. Indoor Swinging. Hanging swings are a great way to instil a sense of calm in kids who have trouble sitting still while simultaneously helping to improve their sense of body awareness and bring them back to a place of zen. Many children refer to these swings as ‘nests’ or ‘cocoons’, and parents rave about their ability to calm meltdowns! CLICK HERE for an indoor swing one of my mom friends swears by for her daughter! Playdoh. Sensory tools like playdoh are great to include in your child’s calm down kit for a quick and calming distraction when emotions are running high. Kneading, molding, stretching, and creating with playdoh can be extremely relaxing and calming, and it’s an inexpensive and portable option if your child needs an outlet while on the go. Being the parent or caregiver of a child with autism is not easy. Not by a long stretch! From figuring out the best therapies and school options, to coping with sleep deprivation and feelings of loneliness, the additional stress of dealing with meltdowns can be extremely overwhelming. In 2016, the Centers for Disease Control’s Autism and Developmental Disabilities Monitoring reported that roughly one in 68 children in the United States has some form of Autism Spectrum Disorder, which means there are many other moms, dads, sisters, brothers, aunts, uncles, grandmas, grandads, and second cousins twice removed who are navigating the rocky waters of autism right along with you. Reach out to them via support groups in your community, find them in online forums, develop friendships with them and remember: you are not alone. If you found this collection of tips and ideas on how to calm an autistic child helpful, please share this post on Pinterest! And if you’re looking for more autism-related tips and tricks, please follow our Special Needs Parenting board on Pinterest, where we share all kinds of helpful information we find each day.